1 – Which subject will you be presenting (related with BI)? We will discuss modern end-to-end BI solutions. Nowadays, everyone recognizes the advantages of a BI solution within a corporation, however not every company is willing or has the possibility to invest large amounts of resources in a solution which at first glance may seem hard to provide the necessary return on investment. This type of solution requires specific knowledge and technical skills to overcome all the challenges such as defining the data models, implementing ETL processes. Having an intuitive and cost controlled end-to-end BI platform, with a powerful Data Integration tool which easily integrates with the most popular Big Data technologies is a huge step to overcome all the usual problems when implementing a BI solution. Adding on top of this a rich self-service BI tool which guides even the less technical users in their analysis and data discovery provides the best of the two worlds resulting in powerful solutions with high ROI. 2 – Which technologies will be presented? Pentaho Data Integration is the ETL tool for Big Data, it has connectors for the most well-known NoSQL databases, drivers and bulk loaders for many analytical databases and besides that it allows developing Map Reduce through a graphical UI. All this is available through a GUI that is very user friendly and thus not only enables lowering the barriers to use these technologies but also having a development cycle that is much more efficient. Orchestrating traditional technologies together with your Big Data implementation has never been so easy and flexible. Nowadays most companies have BI systems already deployed, but are these really able to cope with self-service analytics and data exploration needs? The most common answer is no and that is because self-service BI requires a completely different approach that traditional BI tools cannot cope with. Users need the tool to be intuitive, guide them on their analysis and make them more agile. Tableau is the perfect tool for this job and can be used to complement the traditional BI technologies and enable users to autonomously do the discovery process. 3 – Which practical use case in the many Xpand IT projects, will the Demo present? 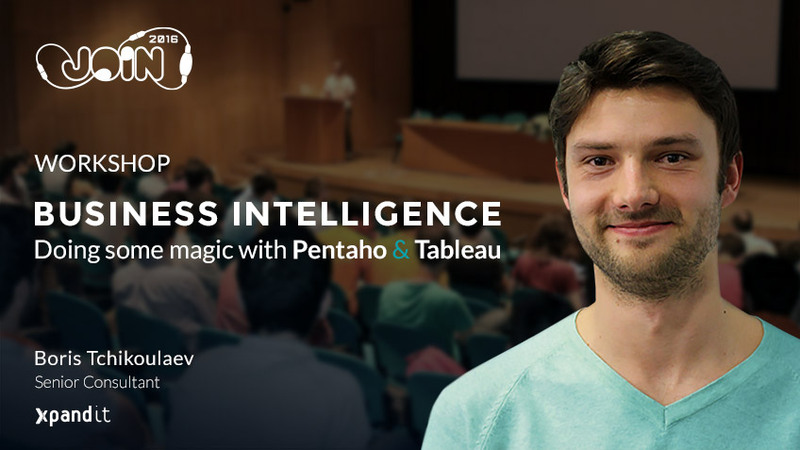 We will bring a Big Data source which will be prepared with Pentaho Data Integration in order to optimize it for Tableau visualizations. This use case is one of the most demanding nowadays, as companies around the world are starting to move all their data and processing into Big Data clusters in order to scale their IT infrastructures and solutions. On the other hand, self-service BI has grown its popularity as it enables all kind of users to take advantage of the data visualization and discovery autonomy which wasn’t possible before without this kind of tools. We will also emphasize these advantages through the demonstration of some projects implemented by Xpand IT.